Elizebeth Ogle's in depth interview with Sheila Kelly, part of "Authors: Stories Behind the Book" series, covers the author's experience and twenty years of research in writing the book. They also discuss the theatrical version, "Treadwell Gold," base on the book, written by play Rachel Atkins, and performed at Juneau's Perseverance Theatre in June 2017. “Despite its lasting impact, Treadwell has largely fallen from our history books. Yet it’s the forgotten chapter that explains how mining would become a successful venture in the far north. 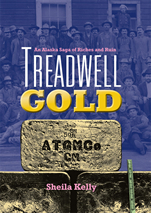 So we can thank Sheila Kelly for filling this void with Treadwell Gold a book that nicely details the rise of Treadwell, offers a glimpse at daily life in the town built atop it, and documents the literal collapse of its fortunes. This is history at its best: readable, entertaining and informative. Through interviews and careful reading of historical documents Sheila Kelly expands her family's story of life in the gold-mining town of Treadwell, Alaska to a full-blown history of the rise and fall of the Treadwell mines and their company town. Details of daily life in town and mines make the tale fascinating. By placing her story in the context of Alaskan development and American labor and mining history, Kelly adds to our understanding of both.